Between 2004 and now, three Coleman fat graft procedures were performed to arrive at the above result. The fat was layered through tiny incisions using special tools developed by Dr. Coleman over the lower one-quarter of this young man’s face and over the lower part of the skull (mastoid). Surgeons are hesitant to operate on body areas that have been treated with radiation because they heal poorly or not at all after a surgical procedure. Recent evidence points to the healing of radiation injury and even aging skin by fat grafting to an area. The healing most likely takes place by bringing in stem cells (or repair cells) which build new blood vessels and capillaries to the irradiated skin, muscle and bone. 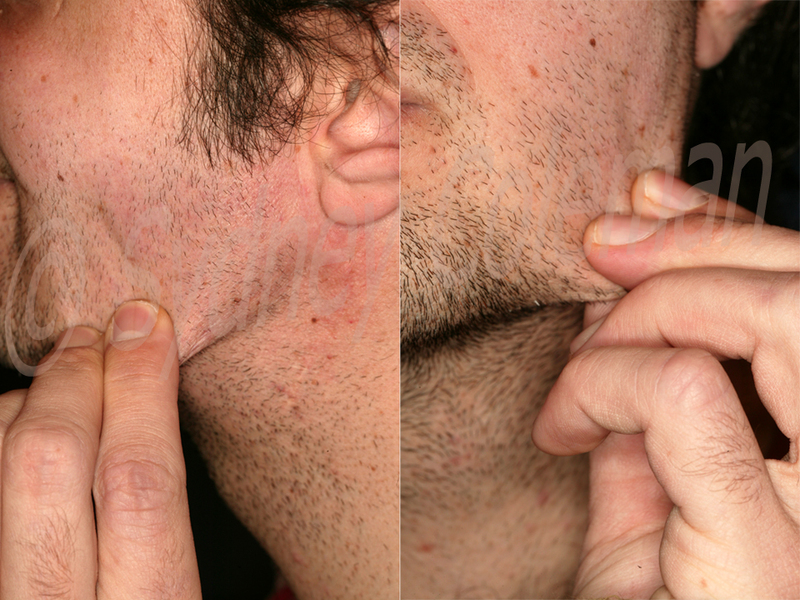 The fat grafts repaired the hard, friable tissues of the lower face in this man to healthy, soft pliable skin. The fat in this situation feels like bone, muscle, subcutaneous tissue and skin. Patient with facial atrophy on the left side of her face, which was treated with two Coleman fat grafting sessions. After (below) patient returns at 15 months with much fuller, healthier face. The key to treating this type of atrophy is to avoid over filling. Patient had craniotomy for aneurysm over one year before and was left with a significant dent in his left temple going up into his hairline. He also had strange sensations in the area. 2 ½ years after the second of two procedures, the patient not only has a smoother skull, but also his nerve sensation problems have improved. This man had a radical neck dissection for a melanoma 20 years earlier. This left him with not only the obvious deformity, but also left his carotid artery and accompanying structures right below his neck skin. Reconstruction of the jawline and neck was performed in two stages. The patient returned six years after his last fat grafting with not only a more attractive jawline, but also protective covering of the contents of his neck. Fat grafting can be used to change the shape of the skull. This man had a flattening of the right side of his skull. 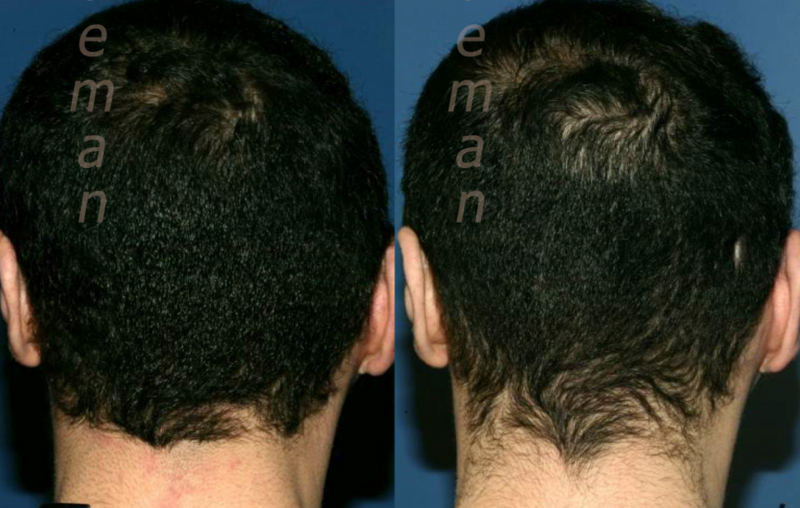 Placement of fat grafts against the bone and into the scalp adjusted the appearance of his skull back to normal. This patient had a craniotomy to remove an intracranial tumor followed by therapeutic radiation. The cranium collapsed creating a deformity in her right temple and scalp. She had an attempt to correct the defect, which was not successful, most likely due to tissue damage from radiation. She subsequently had repair with fat grafting. The patient is shown at left before fat grafting, and at right over two years after repair of the defect with one fat grafting. The patient claimed that her hair also grew back after the fat grafting.